When training our dogs, we can come to a point where we think we need a firmer hand. We wonder if it’s possible to achieve our goals with nothing but a clicker, a bag of treats, and a brain full of behavioral science concepts. The truth is, there’s always a force-free solution. If Santa can train eight 600+ pound reindeer to joyfully deliver presents all over the world, long after their hooves are sore, all without using force, you find a way to train your born-to-please dog with the same skills. I’ve been getting dozens of emails lately from people who don’t believe that Santa really uses positive reinforcement to train his reindeer. 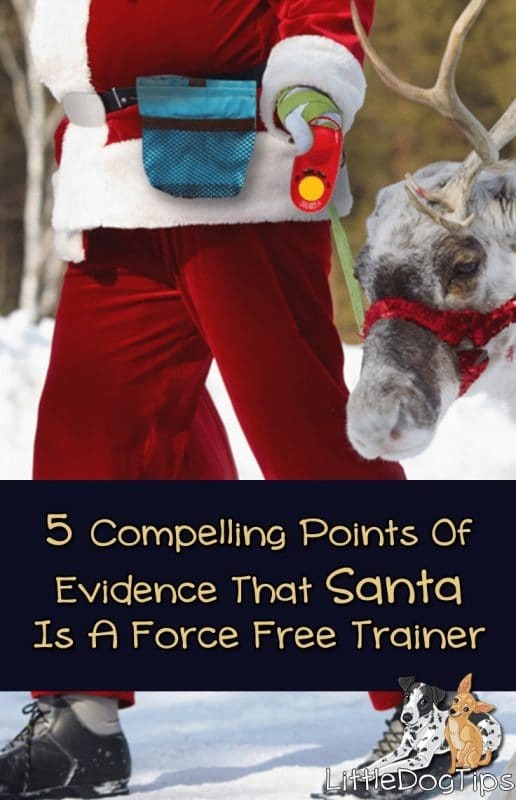 In response, I present you with five rock-solid points of evidence that Santa is, in fact, a positive reindeer trainer. It’s clear that Santa himself is a big believer in the motivating power of rewards – children everywhere have discovered over many generations that his performance is directly related to the quality of their offerings – milk and cookies. In fact, a University of Cambridge study showed that children who left homemade chocolate chip cookies received the most presents, showing positive correlation with the freshness of said cookies. Participants who left out diet cookies and skim milk received Walmart and Dollar Tree versions of the items on their wish lists, while the control group, who left out crackers and water, received nothing but a lump of coal in their stocking. We know that Santa, similarly, offers rewards to his reindeer at each stop. Furthermore, children that leave carrots for the reindeer receive an extra helping of candy in their stocking – and a pile of droppings on their parents’ rooftop. It’s the fiber, it goes right through them. Rarely have we taken note of how Santa handled bullying amongst his young prospects. He did not punish bullies, or even ban them from the sled team. He simply drove the other reindeer to respect Rudolph through leading by example. He offered Rudolph the coveted lead position in his sleigh line-up while putting that perceived flaw to good use. That’s all it took for the rest of the reindeer to recognize Rudolph’s unique gift – and that mocking behavior was no longer self-rewarding. That iconic chorus line in the classic Christmas song, “Up On The Housetop,” isn’t just referring to the clatter of reindeer hooves on your rooftop. Reindeers have tendons over their kneecaps that click when they walk. This clicking sound allows them to stay in contact with the herd, even when it’s foggy. Some sources report sightings of Santa training his reindeer to get into formation with a festive box clicker. The need for precise timing when guiding reindeer into position explains the need for a short, attention-getting marker. So, this really comes as no surprise. Positive reinforcement training, as we know it, originates with marine animal trainers. You can’t use force to train an intelligent animal that weighs thousands of pounds. You use clear communication, signals and rewards. What few people realize is that the song’s writer, Randy Brooks, lost his grandmother to an unfortunate reindeer incident in 1974. Santa’s legal team and PR firm are, of course, the best in the world, which is why this incident has been covered up for so many years. After the release of the song, Santa’s legal team immediately filed a civil lawsuit for defamation, but the case did not go far, as the public widely perceived the song to be tongue-in-cheek. This blog post is dedicated to the loving memory of Grandma Brooks, may she rest in peace. Upon digging up the case files, I discovered that the body of Grandma Brooks was found with one slipper on, one laying next to the body. We can only draw the conclusion that Dasher, known to be the most volatile of Santa’s now-retired team, had pooped on the lawn, and Brooks endeavored to punish him with her slipper. Dasher must have been spooked, and reared up, crashing down on the woman. Reindeer are not known to attack people, but they are sensitive and will lash out if they feel threatened. If Santa used force to train reindeer, he would be long dead by now. Though flying long distances in pursuit of yum-yums comes naturally to reindeer, they do have to learn complex flight routes. Early on, they have to learn to adjust to wearing a harness bedecked in jingle bells. They have to refrain from eating the gifts. And they especially have to learn to happily settle down in their stalls at the end of a successful Christmas Eve flight. That’s why it was so devastating for the other reindeer to exclude Rudolph from their Reindeer Games – they were depriving him of the education that would make him employable as an adult. 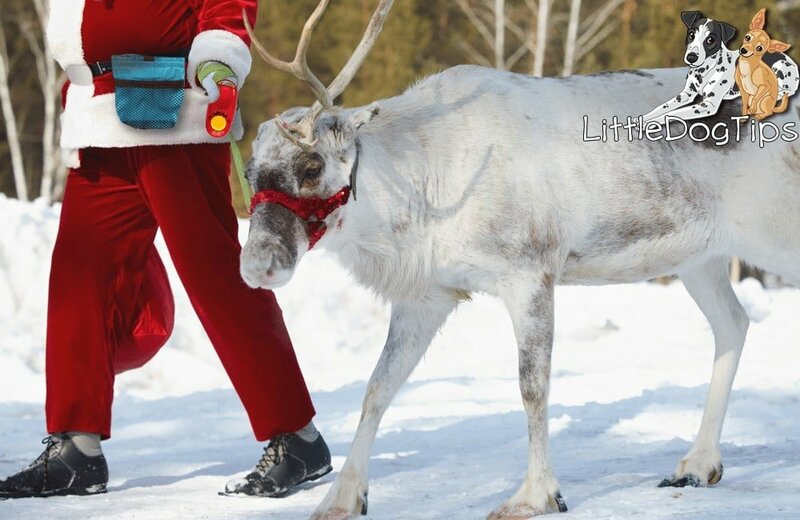 Fortunately, he managed to pick up on all of the necessary skills to become a revered sleigh leader – while loving every minute of it. This is the strongest point of all – the fact that traveling thousands of miles in one night has to be fun. It has to be rewarding. That’s the only way to have a motivated team that “shouts out with glee” every Christmas Eve. This post is awesome! 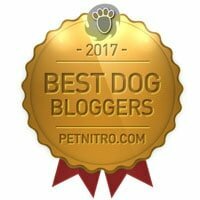 I use positive based training methods for my two dogs, and it sounds like I’m in good company. Happy holidays. This post is so cute! You are such a great creative writer. Yup, no need to ever “train” an animal with force, fear or intimidation. Only bullies need to train that way. Love this post especially as I have never thought about the training of the reindeer. 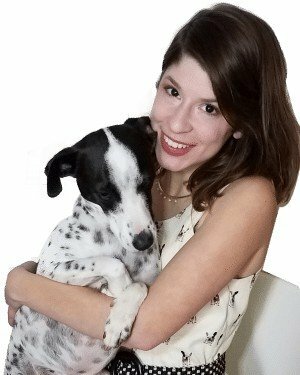 I do not believe in bullying in any kind and training a dog with love and patience is the only way to go. This is a great post! I’m a behavioral psychologist, and I truly believe in reward-based interventions vs. punishment. Thanks for making me smile today. What a lovely en encouraging message I will share this with my grandson so that he can read it. Rewarding and leading in a positive way is just the right thing to do. With humans and with pets too. This is the best!!!! Totally sharing it with my trainer friends. What a fun read. I totally agree that force free is the way to go. Why use force if you can get there with food? I love this so much! Too bad that Grandma Brooks didn’t know that positive reinforcement is the only way to go. How can anyone fore a dog to learn by fear? The whole idea is just creepy to me, but I know there are plenty of people who really need something fun like this to make them change direction. 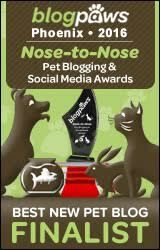 Positive reinforcement is the only type of reinforcement backed up by science and statistics. Negative reinforcement is less effective and can impact your relationship, whether with family or canine. I love this! Very cool way of presenting positive reinforcement training! (The ONLY way to train, isn’t it?!) Bravo to such a creative piece! Pinning to share! HA! I love your presentation. What a great job. Lindsay this is so clever, I love it! You’ve made a great case for clicker training – I didn’t know reindeer legs actually make a clicking sound… Thanks for the chuckles, I needed it! What an adorable post! I love how you connected positive reinforcement training with dogs with Santa’s reindeer.